Posted April 29, 2013 . Filed under Featured, Journalism Research Group, News & Events. 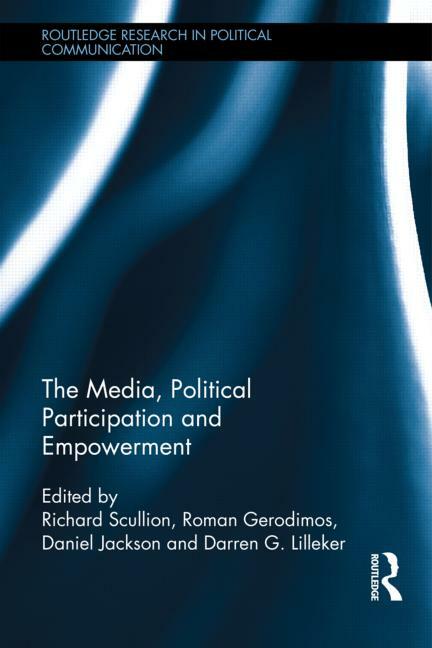 Congratulations to Richard Scullion, Roman Gerodimos, Dan Jackson and Darren Lilleker, who have had their edited collection The Media, Political Participation and Empowerment published by Routledge. The book came out of the Media & Politics Conference organised by its four editors at Bournemouth University in November 2011 and is the latest in a series of initiatives promoting innovation in the study of politics and media, including the launch of the BA Politics & Media programme and the coverage of the US 2012 presidential election by NewsLab last November. How much and what sorts of civic and audience empowerment are most desirable, and how does this differ cross-nationally? How do citizens relate to private and public spaces? How do citizens function in online, networked, liminal and alternative spaces? How do audiences of ‘non-political’ media spaces relate their experiences to politics? How are political parties and movements utilising audiences as co-creators of political communication and what are the consequences for democracy? With examples from the UK, USA, Holland, France, Germany, The Middle East, South Africa and Mexico, this innovative volume will be of interest to students and scholars of political science, marketing, journalism, cultural studies, public relations, media and international relations. Full table of contents and ordering options for the book are available on the Routledge website. The Media School is one of the UK’s leading hubs of teaching and research in political communication. It hosts three of the Political Studies Association’s specialist groups: Media & Politics Group, Greek Politics Specialist Group and Political Marketing Group.